Corporate team bonding cooking activities. Let us design a culinary cooking team building program for you. 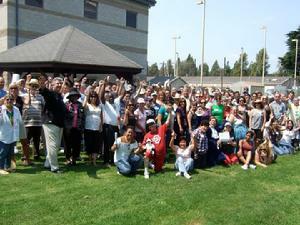 Team Building Certified Event Planner Los Angeles California and Las Vegas Nevada. Los Angeles Culinary Team Building, Team building Cooking programs and Team Building Culinary Cooking Activities. Team Bonding events including culinary cooking challenge, salsa wars, chili cook offs, and team building workshops. WHAT WE DO: Let us transform your team building group into team building chefs! OUR DIAL M CHEF COACHES begin the program with a brief but important orientation of the evening and what is to be expected during this “CULINARY TEAM BUILDING CHALLENGE”. Participants are asked to wash their hands in preparation team building cooking challenge. We will coordinate your team building cooking group into cooking teams. CULINARY TEAM BUILDING CHALLENGE: The team challenge will be determined by the goals we have set with you for this event. The food challenge selected will be based on the facility where we will be hosting the event, length of time allowed for this team building activity, and the budget you have given us for the food supplies. MENU: The menu can be very simple to extravagant. Some menu options are: Complete Buffet Meal (appetizer, salad, entree, side dishes, dessert and signature cocktail), Chili Cook-Off, Salsa Contest, Cake Wars, Pasta Wars, Fondue Fun, Wine Blending and Signature Cocktails. 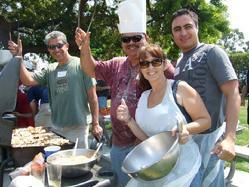 TEAM BUILDING: In addition to the culinary challenge, we will include our Team Building Cooking Coaches. Custom design team building cooking tasks will be created to keep your team building group focused on food preparation, working as a team and the goal. This team building cooking event requires real teamwork! SCORING: Team building teams will have to work together to perform all culinary tasks on time. A combined score of the tasting, teamwork, and plating will give us our champions for the day. DIAL M FACILITATORS: In addition to providing the Culinary Program, we can provide one Facilitator for each team. Our Facilitators will assist the teams with their time management, supervise the work stations, offer food instruction and follow through with the team building goals we have designed for your group. Let this Los Angeles Team Building Culinary Cooking Company provide your next team building cooking challenge. CULLINARY CHALLENGE: The challenge will be determined by the goals you have set for this event. We can present a very simple taste test for the judges, appetizers for the group, a light lunch, dinner, or a complete multi cultural buffet. The meal will be selected based on the facility where we will be hosting the event, length of time allowed for this team building event, and the budget you have given us for food supplies. The meals can be very simple to extravagant. Some menu options are Chili Cook-Offs, Salads, Hors d’oeuvres, Multi Cultural Buffet, and full Gourmet Meals. BUT THERE’S MORE! That is where most team building cooking events start and end. With Dial M Productions we can offer the basic cooking challenge (above), or continue on with comedy and entertainment to make this team building experience more that just food preparation as a team. We design this as an “Iron Chef” type program where teams receive the same ingredients, ideas on what can be created with those items, and are asked to create their own dishes with those ingredients. They are not following recipes but creating their own meals from the ingredients provided. This requires real team-work! 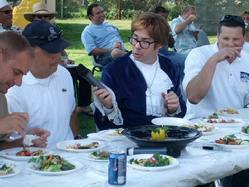 JUDGES: Let our celebrity judges score the meal! Our official tasting judges, Donald Trump, Martha Stewart, Paula Abdul, Cher, Tina Turner, The Godfather, and Jack Nicholson, can scoring each team on zest, taste, presentation, original flavor, team work, and best all around meal. The number of celebrity impersonators will be determined by your budget. Each team has the same amount of time to complete the challenge, oh, and that is without the use of recipes! Guidelines are given, not complete recipes. Teams must rely on each other’s life skills and experiences to be successful, just like in the real world of business. Teams are allowed to roam and barter for ingredients with other teams, the very people that they are competing against! At the conclusion of the cooking part of the program, time is called, participants raise up their hands to indicate that cooking is complete. The judge’s table is presented with a single serving from each team on a decorated plate. The participants are judged both for the small plate presentation to the judges as well as the large platter presentation for the buffet. All of the participants now help themselves to the outcome that they all contributed to, a multi-cultural, gourmet buffet that would make any professional chef proud.